The 58,000-square-foot facility is comprised of eight service bays, each measuring 120-feet long. Klorman Construction’s Formwork and Concrete Divisions provided the structural concrete for the foundations, maintenance pits, walls and pilasters, and the special supports for tracks. Klorman’s Virtual Design and Construction Department was responsible for the Building Information Modeling (BIM) to manage the project and coordinate clash detection, formwork drawings, shop drawings, scheduling and resource management. 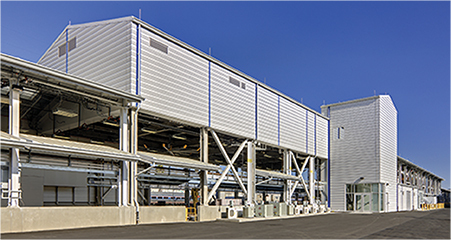 The project is complex and unique given the configuration of the service bays. A track and service trench runs full length of the building to allow for train cars to pass through the facility. The bays consist of two open-air inbound bays for staging and preparation of cars to be serviced, five service bays where most servicing is done and one outbound bay which allows for last moment staging and servicing.